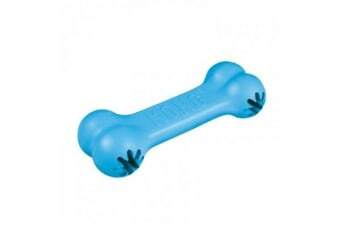 Approximately 13cm long and ideal for puppies up to 9kg, the Kong Puppy Goodie Bone is designed to entertain. Fill the patented Goodie Grippers with puppy treats for a happy, busy puppy. Made from a softer rubber which is suitable for puppies, the Kong Puppy Goodie Bone can be stuffed with, your, dog’s favourite treats or snacks, at either end. This should keep your puppy happy and entertained for long periods! While made of highly durable rubber, the Kong, Puppy Goodie Bone, is designed for puppy strength chewing and is not as durable as other Kong toys such as the Kong Classic or Kong Extreme. The Kong Story: KONG was founded by Joe Markham., Joe loved his trained police dog, Fritz,, but did not love his destructive chewing habits. Where other dogs might have chewed your shoes or favourite purse, Fritz loved to crunch on rocks, sticks and other harmful items. Fritzs teeth were wearing down and his need for stimulation and play was not being met., Joe was frustrated. One day, while working on a VW Bus, Joe began throwing out car parts to Fritz to lure him away from those rocks. Fritz was immediately taken with a rubber suspension part and dropped it in Joes lap to play. The erratic bounce and toughness of the rubber inspired Joe. KONG has been making toys, from their own proprietary, pet-safe, built-to-chew rubber ever since. Dogs love KONG. The way it bounces keeps them engaged and ready to play. It has a soft mouth feel for a satisfying chew and, of course, its super durable. Owners love KONG too; they can stuff it, throw it, leave it out in the yard , KONG keeps coming back for more. Dogs and their owners choose the original KONG and all of our other favourite toys because theyre fun. KONG toys are the best of the best in quality, originality, variety, safety, and value. Give a dog a KONG. Theyll be the first to show you: its not just a toy, its a KONG. Do you need treats to stuff into your puppys new favourite toy? Check out our range of tasty puppy treats here!